I often hear people claim "global warming will cause the ice-caps to melt, and that will cause the water levels in the ocean to rise, and that will cause major world-wide flooding." Now, ignoring the question "are ice cap melting", I am still wondering how it is possible for melting ice-caps to cause water levels to rise. According to the law of displacement, the volume of an immersed object will be exactly equal to the volume of the displaced fluid. Therefor, if an icecap is floating in water, the displacement of the water would be based on the volume of the icecap, not it's shape, and the levels should be the same regardless of whether or not it is melted. In fluid mechanics, displacement occurs when an object is immersed in a fluid, pushing it out of the way and taking its place. The volume of the fluid displaced can then be measured, as in the illustration, and from this the volume of the immersed object can be deduced (the volume of the immersed object will be exactly equal to the volume of the displaced fluid). In the case of an object that floats, the amount of fluid displaced will be equal in weight to the displacing object. The icecap will have the same weight, regardless of whether it is in ice form, or liquid form. So how is it that people claim that melting ice caps can cause floods? Shouldn't water level stay exactly the same? Icecaps includes polar ice, and smaller icecaps. Antarctica contains 70% of the world's ice and the vast majority of this is on land, so there is no displacement confusion - if it melts it will pour off the land into the sea, thus raising the sea level. The thickness of ice on the Antarctic continent (from this paper at RD Springer) averaged 2.2km in the East Antarctic Ice Sheet! — FAQ 5.1 Is Sea Level Rising? In other words, as the ocean warms up it expands and as the land ice melts, it pours into the ocean. At the moment the contributions are 50% each. 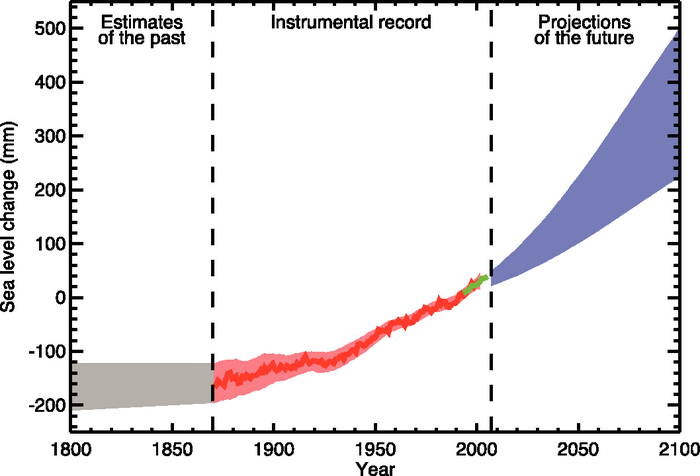 —Time series of global mean sea level (deviation from the 1980-1999 mean) in the past and as projected for the future. While the melting of Arctic sea ice may have little direct effect on sea level rise, it will substantially reduce the albedo of the Arctic ocean as sunlight will be absorbed by the dark ocean water, rather than being reflected back into space from the bright ice. This is likely to result in a general warming of the Arctic region, which is likely in turn to result in melting of the Greenland ice sheet, which would result in a very substantial rise in global sea levels over the course of a thousand years or so. This means there is a good reason to be concerned about the loss of summer (when albedo really matters) Arctic sea ice from a sea level rise perspective. This is known as ice-albedo feedback, there is a basic discussion on Wikipedia, a slightly more detailed explanation is described here by the NSIDC, a relevant section of the IPCC WG1 report is here and here. Not the answer you're looking for? Browse other questions tagged physics climate-change . Did both higher temperatures and an ice age exist at CO₂ levels ten times the present? Will most tropical and temperate areas be uninhabitable with a 5 degree increase in temperature?